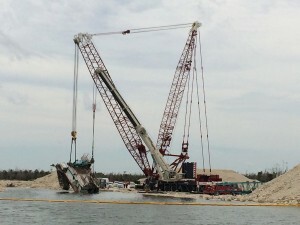 A Manitowoc crane that slipped off a bank into 70ft of water has been successfully rescued by Florida-based Crane Rental Corporation (CRC) in a tandem lift. CRC used a Manitowoc 2250 crawler crane with MAX-ER attachment (500t capacity) and a 600t Terex AC 500-2 hydraulic truck crane to lift the submerged Manitowoc 4600 dragline. The total weight lifted was 484,000 pounds. CRC had to supply pre-lift plans and submit them to the Mining Safety and Health Administration for approval. It also supplied a lift director, skilled riggers and certified crane operators for the job. The company has performed nearly a dozen recoveries after similar accidents and has engineered specialised rigging for such projects. Engineers assessed the machine and had to predict the components’ stored energy before divers cut the boom, mast and heavy-duty wire rope. Underwater cameras and communications were essential as the divers’ exposure had to be limited at the depth.